Sgt. 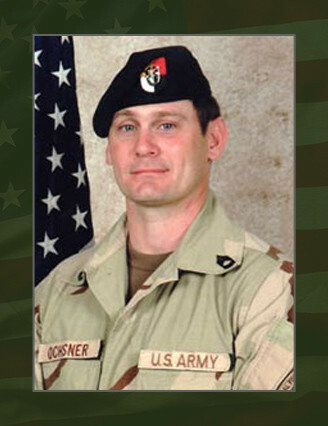 1st Class James S. Ochsner, 36, a Special Forces intelligence sergeant assigned to 2nd Battalion, 3rd Special Forces Group (Airborne) at Fort Bragg, died Nov. 15, 2005, as a result of wounds sustained from an improvised explosive device which detonated while Ochsner was riding in an Up-Armored Humvee near Lawara, Afghanistan. He was in the process of distributing supplies to local nationals at the time of the attack. Ochsner, a resident of Hope Mills, N.C., enlisted as an artilleryman in 1987. His first assignment was with 2nd Bn., 14th Field Artillery in Bamburg, Germany where he served for three years. Ochsner then reclassified as an infantryman and served in the 82nd Airborne Division, Fort Bragg, N.C. where he participated in Operation Desert Storm and completed a tour in the Sinai Peninsula and South Korea before he volunteered as a Special Forces Soldier. He graduated from the Special Forces Qualification Course in 2001 and was assigned that year to 2nd Bn., 3rd SFG, as a Special Forces communications sergeant. In 2004, he graduated from the Special Forces Operations and Intelligence Course. He then returned to 2nd Bn., 3rd SFG and was serving on his fourth combat tour to Afghanistan as an SF intelligence sergeant upon his death. Ochsner’s awards and decorations include the Bronze Star Medal with oak leaf cluster, Army Commendation Medal for valor, Army Commendation Medal for service, Army Achievement Medal, Good Conduct Medal, National Defense Service Medal, Afghanistan Campaign Medal, Global War on Terrorism Service Medal, Korean Defense Service Medal, NCO Professional Development Ribbon, Army Service Ribbon, Overseas Service Ribbon, Kuwait Liberation Medal (Saudi Arabia), Kuwait Liberation Medal (Kuwait), Combat Infantryman Badge, Expert Infantryman Badge, Parachutist Badge, Air Assault Badge, Driver and Mechanic Badges, and the Special Forces Tab. His posthumous awards include the Bronze Star Medal, the Meritorious Service Medal and the Purple Heart. He is survived by his wife, Ann, his son, Nicholas, and daughter, Meagan of Hope Mills. His parents, Robert and Sandra, of Beach Park, Ill, also survive Ochsner.